If you’ve been here long, you know we are ALL Disney obsessed. 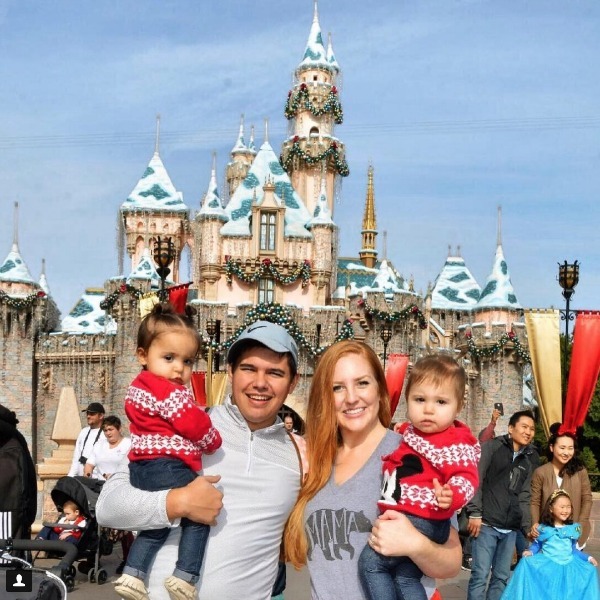 As soon as my husband started looking at prospective jobs in Los Angeles four years ago, I was excited for quite a few reasons, but mostly because I could possibly be living SO CLOSE to Disneyland. Fast forward four years, and here we are. You’d think my craving for all things Disney would have been satisfied with how often we go, but really, my love for it just grows with every visit! Haha 🙂 I get asked a lot what my best tips are for doing Disneyland and what I’d recommend, so here are all the delicious details in one post for fellow Disney lovers like me. 1. The first thing to remember is that you won’t get everything on your list! 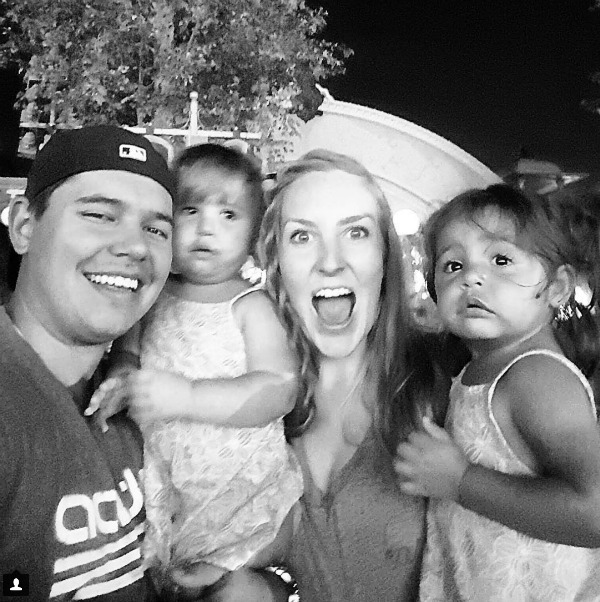 We were at Disneyland more than 30 days last year (that’s an entire month!) and we still didn’t experience everything that they have to offer in the parks. Before you go, decide what’s most important to you and to your group and focus on a few main things that you don’t want to miss. 2. You only need one app – the Disneyland official app. Through that app, you can make dining reservations, see where character meet-and-greets are in the park, check wait times, and see all the entertainment scheduled throughout the park that day. You can also access any photo pass photos that are taken throughout your trip, and use the Max Pass (more info on that in a minute!) through the Disneyland app. We’ve found it’s the most up-to-date when it comes to ride closures, wait times, and for entertainment schedules compared to other apps. You can also see information on each ride – like height requirements, thematic elements, and what age group the ride is best suited for. 3. It’s OK to bring young kids. In fact, I’d recommend it! 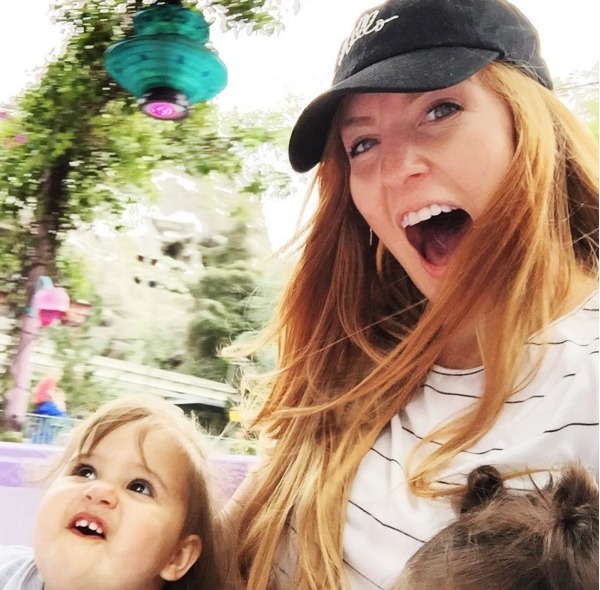 Disney is so much more magical when experienced with little ones! The parks are incredibly kid-friendly, and even BABY-friendly. There are nurseries/baby changing stations in both parks that make it easy to take care of little ones. They even offer plenty of chairs for breastfeeding, entertainment for little ones that need a break, high chairs, a whole room dedicated to changing tables, and they even have a tiny toilet that you can use when you’re potty training toddlers (seriously, they think of it all). The care center in Disneyland is located right off Main Street by the First Aid center, and the one in California Adventure is located right by the Ghiradelli store. They also offer a ride-switch pass to parents, so if you’re there without additional adults to watch kids while you go on “big kid” rides. Just ask the cast member at the entrance to the ride for a rider-switch pass before you get in line. To those who questions whether or not it’s worth it to bring young kids who won’t remember anything, I say: THEY may not remember it, but I most certainly will. I mean, just look at that FACE! 4. Consider the time of year you’re going before you book your trip. The busiest times of the year are in the summer (June through August) and/or surrounding holiday weekends. If you’re looking for less crowds, try going in January through March or in September and October. If you want to experience the EXTRA Disney magic during the holidays, always go sooner rather than later! (I.e. if you want to go for Halloween go at the beginning of the month when it’s first decorated or if you want to go for Christmas, go the last week of November or the first week of December before it gets too crazy). If you like to avoid crowds definitely skip the week leading up to Christmas and the week following Christmas. Usually the park is SO PACKED for those two weeks that the parks reach capacity around 11 AM. The weekdays in the parks are always less crowded, too. Saturday and Sunday are almost always more crowded. 5. Speaking of TIMING – when you are at the parks, it’s best to get there early, especially if you have little ones who want to ride all the rides in fantasyland and not wait 50 minutes (those rides don’t have Fast Pass or Max Pass options). The earlier you get there, the less crowded it will be. I’d recommend getting there as soon as the park opens (or even get in line BEFORE the park opens). If you’re staying at the Disney park hotels or get a 3-day park hopper with a magic hour, BE SURE TO USE IT! You can literally get on all the rides you want to ride before the park even opens to the rest of the general public. Then you can just enjoy the rest of your day soaking in all the magic and taking things slow (which is so nice when you have little ones!). 6. Take advantage of the Fast Pass feature! And in my personal opinion, GET THE MAX PASS! Fast pass is free, but Max Pass is $10, per person, per day (and it is 100% worth it). With Fast Passes, they are a physical ticket you have walk over to the ride to pick up and keep with you until it’s time to ride. While they are great and can get you on the ride in a short amount of time, you still have to take the time to walk to the ride to pick up the fast pass. When you use the Max Pass feature, it’s all ELECTRONIC! You can book a Max Pass through your mobile device from anywhere inside the parks without having to walk to each individual ride to pick it up. When you have young kids with tired feet, it’s well worth the investment (even if it’s just for one day). 7. Speaking of mobile devices, if you’re anything like me, you’ll be using the Disney app to check times, book max passes, and using your phone to take about 300 photos every time you’re there, so I would recommend getting a portable charger. THIS ONE is my favorite and can fully re-charge your phone 4-5 times. Worth every penny. 8. One of the best things about Disneyland and Disney’s California Adventure are the SHOWS! Whether it’s fireworks, Fantasmic, Parades, light shows, or a sit-down show in a theatre, you really can’t go wrong. If you would rather not wait as long saving spots, several restaurants throughout the parks offer preferred dining packages with reserved seating areas (also worth the money with young kids, in my opinion). World of Color (which is my FAVORITE) also has Fast Passes available for reserved seating – get there early in the morning for better seating! The indoor shows are always a great, air-conditioned place to rest from the heat of the day, too. 9. You KNOW it wouldn’t be a post of Disneyland recommendations without FOOD, right? Let me just tell you, the food in the parks is one of the best parts of the experience! I literally factor food into my budget for each trip to the parks because I just can’t get enough – and they are adding new things all the time. They have fun food festivals and specialty foods surrounding holidays or big events (like Pixar Fest, happening now through September 3rd). Jolly Holiday: We love the grilled cheese and tomato basil soup, but our favorite thing on the menu is their raspberry rose macaron (pictured below). 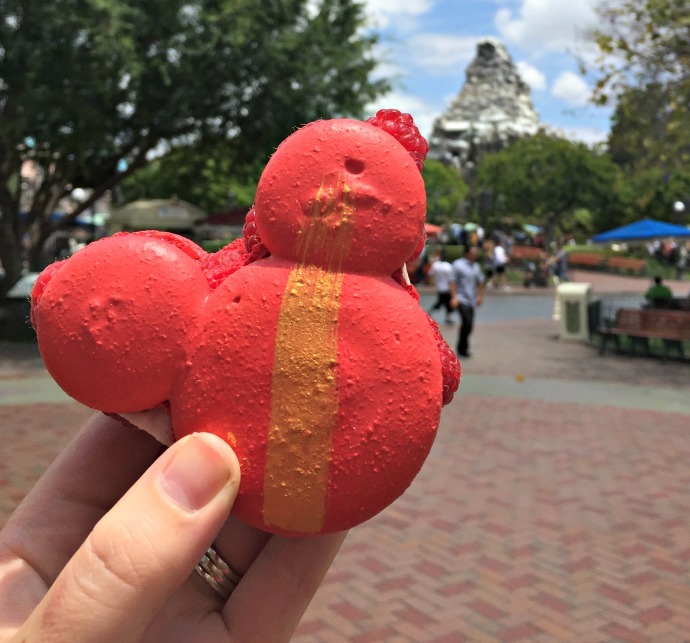 The matterhorn macaroon is also a fun, tasty treat. Carnation Cafe: Good meatloaf, DELICIOUS fried pickles. Plaza Inn: I hear they have delicious breakfasts, but their FRIED CHICKEN is our favorite. Cafe Orleans: Get reservations, then order the Monte Cristo, Pommes Frites, and Beignets and thank me later. If you’re a fan of gumbo, I’d recommend that, too. Blue Bayou: Nothing beats that atmosphere, but the Gruyere Mac ‘n Cheese comes a close second. Their gumbo is hard to beat, too. (You’ll definitely need reservations here – you can book up to 60 days in advance). Red Rose Taverne: The grey stuff really is delicious! Also, POUTINE. Tiki Juice Bar: Every trip to Disneyland needs a Dole Whip. No question. Pooh’s Corner: We like to get our treats here because it’s usually a lot less crowded. I’d recommend the Tigger Tails, caramel apples, white chocolate raspberry cookies, and the chocolate-dipped peanut butter squares (most of these treats are available in both parks anywhere they sell confections). Carts throughout the park: You can never go wrong with the popcorn, churros, or their cream cheese filled pretzels! Carthay Circle: Cutest old-hollywood glam atmosphere (and you’ll probably want reservations). We’ve done dining packages through here for World of Color and really liked it! (side note, it’s $$$, but I hate saving seats for 3 hours and trying to keep young kids entertained to get a good spot to see shows). Ghiradelli: We love their Ocean Beach Sea Salt Caramel Sundae, Nob Hill Chill (my husband’s fave) and the Sea Salt Caramel Quake Shake. Plus, you get a piece of chocolate just for walking through the door! 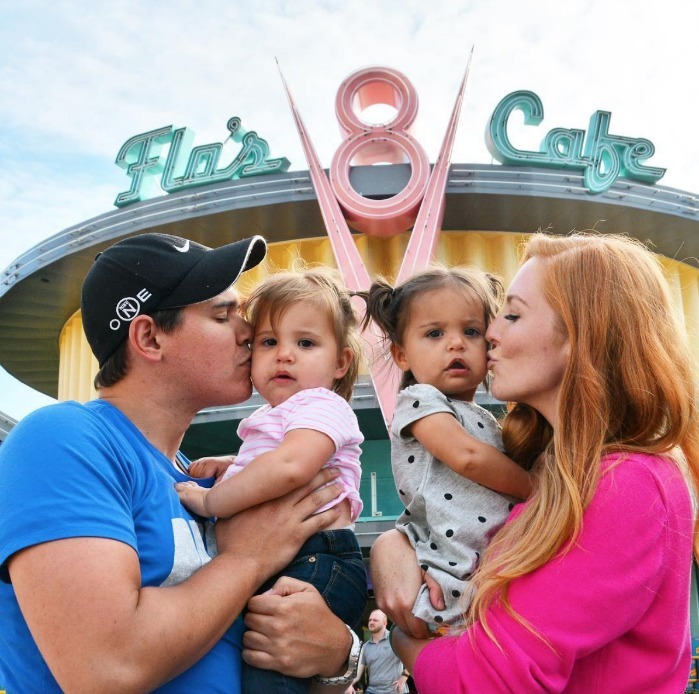 Flo’s V8 Cafe: Their breakfast is delicious, and they have sides for $2.99 that are the exact same size as a kid’s portion, so we get the kids sides for dinner every other time we’re at the parks! Cozy Cones: Their churros with dipping sauce, Red’s Apple Freeze, and the Bacon Mac ‘n Cheese bread cone are all delicious! Pacific Wharf Cafe: I’m not sure there is anything better on a cold day than a warm, sourdough bread bowl full of clam chowder. Schmoozies: My favorite place for ice cold fruity drinks on hot days at the parks, but they also have AMAZING donuts and cronuts (if you can get to them before they sell out!). Studio Catering Co: If you couldn’t get into the Cove Bar (they don’t take reservations! ), you’ll want to try the “Obviously Nachos.” They are a close second to the Lobster Nachos. Corn Dog Castle: I’m not a huge corn dog fan, but even I will eat these corn dogs! Turkey Legs: Okay, so these aren’t my favorite thing (they’re a little greasy for my taste), but I feel like they are a right of passage in the Disney realm. You have to try it at least once! That’s it! Have any more questions? Have anything to add to the list? I’d love to hear! Looking to book your next Disney Vacation? Check out Get Away Today for great deals on tickets, rooms, and flights! My latest fave is the Lemon and Blue Raspberry Pixar Pier Parfait found at “Adorable Snowman Frosted Treats” in California Adventure! If you haven’t tried it yet, you must!! !